A few days ago Remedy posted a photo on Twitter of Ilkka Villi, the actor who portrayed Alan Wake and Mr Scratch, on stage the Finnish Game Awards. It's been hinted that we'll be seeing more of Quantum Break in the Summer, however in the meantime it's going to be pretty quiet and the perfect opportunity to talk about things like this event. I also wanted to write this post as you might be curious about the show and what happened! If you've been following The Sudden Stop you might know that I'm in love with the gaming industry in Finland. I live in the UK where, we've only recently introduced tax breaks for developers and publishers. In the past decade many companies have been switched to studios abroad or had changed their HQ to save money. Finland seems to look at video games in a completely different light. There are government programmes such as Tekes set up to support both start up and big name developers. In addition to that, there are also various ways to get into the industry through events like Aalto in the Game, Assembly and Rovio's Summer Programme. This support helps encourage the industry to expand their business and tackle bigger challenges. As a result, in 2013 the turnover for the core video games industry increased from €250 million to €800 million...Yeah. It's interesting to note that the industry was predicted to increase by 50% in 2014, so clearly someone was feeding it after midnight! To celebrate the constantly growing industry, Suomen pelikehittäjät ry arranged the first ever Finnish Game Awards. The ceremony had four categories; "Finnish Game of the Year 2013", "Finnish Rookie of the Year 2013", "Finnish Sensation of the Year 2013" and "Finnish Gamer's Choice 2013". This year Remedy wasn't nominated, but with Agents of Storm and Quantum Break still in development, I'm sure we'll see them in future events. Ilkka Villi co-hosting the awards ceremony. Photo from Remedy's Twitter page. 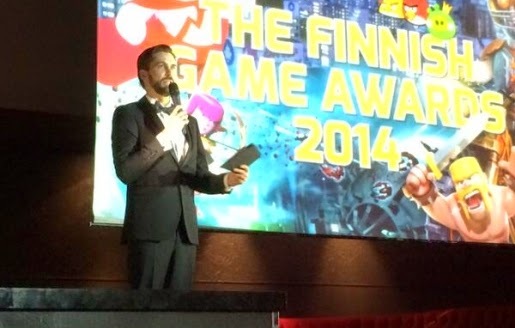 Housemarque won the Game of the Year and Finnish Choice Award with Resogun. Also nominated in the Game of the Year category was Badland by Frogmind, The Swapper by Facepalm Games and Oceanhorn by Cornfox Brothers. Facepalm Games took home the Rookie of the Year award - for which Frogmind, Next Games and Seriously were also nominated for. Theory Interactive won Sensation of the Year Award for their impressive crowd funding for Reset. Other studios which were nominated in that catagory include Next Games, Facepalm Games, Hill Climb Racing and Supercell. For more information, check out the post at Neogames, HERE.